This is a re-ranking. I had seen, but not reviewed, the first IRON MAN. I haven’t seen the third IRON MAN. In between, I saw the second IRON MAN and reviewed it four years ago. I don’t remember what I said. I’ll link to it eventually, just in case you care about a four year old opinion of an unimportant theater goer. Know what? Maybe I won’t link to it. Below, at least, is the unimportant opinion of someone who JUST watched this thing. I watched IRON MAN 2 (2010) on 4.26.14. It was my second viewing of the film and first since it was in theaters. 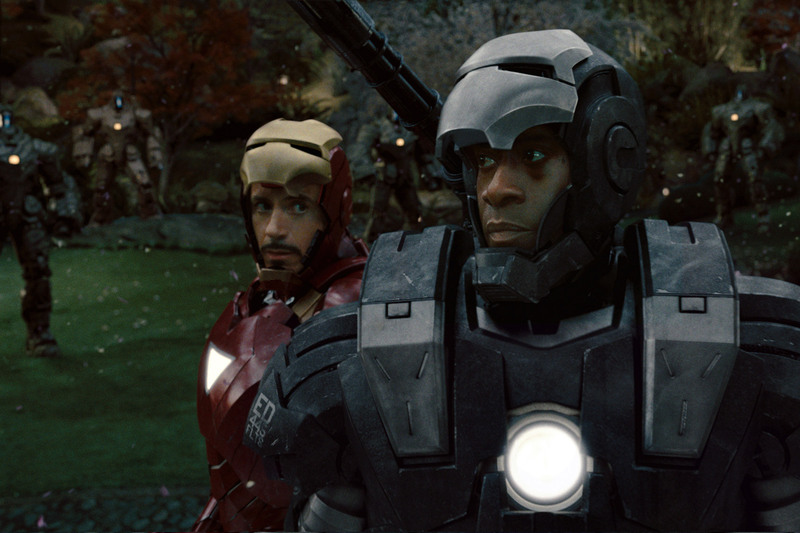 The opening scene of IRON MAN 2 mirrors the first act of IRON MAN one. A brilliant man in less than perfect conditions engineers groundbreaking technology for a single purpose. In the first movie that man is Tony Stark (Robert Downey Jr.) who makes the IRON MAN tech in a situation which has him fighting for survival. In IRON MAN 2, that man is Ivan Vanko (Mickey Rourke) and his purpose is revenge (against Stark, as it turns out). The pacing in the second movie is not any quicker than it is in the first. Where that proves an asset in the first film as we are introduced to character, it sometimes can be surprising how far we go in the second movie without seeing Iron Man come out to play. The dialogue is not quite as crisp as it was in the first, as if everyone began to realize just how clever they were. This isn’t as drastic a drop off as, say, OCEAN’S 11 to OCEAN’S 12, but there is still a noticeable decline in truly funny stuff. Rourke plays a great villain here, though his bankrolling partner Justin Hammer (Sam Rockwell) is not quite as successful. Rockwell is a likable actor but he tries a little too hard to be unlikable in IRON MAN 2. You don’t end up hating his Hammer, you end up just sort of being annoyed any time he shows up. The movie has plenty of conflict, but it seems always to be far away and not particularly scary. Nothing in IRON MAN 2 is as scary, for example, as the simple paralysis device Jeff Bridges totes around in the first film. Scarlett Johansson brings some gravitas to Black Widow, managing to hold her own with Downey’s flirtatious advances without coming across as a mere objectified young female character. Her introduction is one of many illusions to the expanding Avengers universe. Nick Fury (Samuel L. Jackson) is front and center here, as is Agent Coulson (Clark Gregg) who seems to be around only to drop Hulk sized Easter Eggs for fans of the Avengers comics. There is nothing subtle or guarded about these allusions, and they come across as clunky now that the rest of the Marvel universe has had time to get its feet wet on screen. IRON MAN 2 is a fine enough sequel. It entertains right until a majorly anti-climactic final battle. Even if the dialogue isn’t sharp, it is serviceable. Everyone is having a good time making it and noone is just mailing it in. It could have been better. It could have been more like the first. Instead, it exists as a nice enough place to visit here and there, but not a good enough film to hold up as one of the upper echelon of the Marvel movies. ~ by johnlink00 on April 27, 2014. Haven’t seen this film since it was at the very end of its theater run. To be fair I was in a VERY crappy mood when I saw it, but it just lacked the fun of the original for me. I don’t know what was up with Downey in this one, but he seemed to be phoning it in. The final fight against Rourke’s character is also very unsatisfying after all the build up. Seriously, it lasts for like five seconds. Not a terrible movie, but definitely a disappointment. Disappointing, yes, but still fun because the cast is just good enough. Good review John.